The S9 Series of transverse rotary combines from Gleaner is now available in Australia. Two new Gleaner S9 Series combine harvesters with all-new features have been released onto the Australian market. 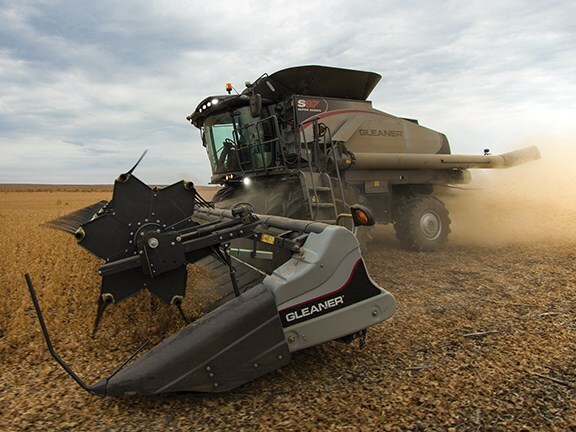 The S9 Series of transverse rotary combines from Gleaner — a brand from AGCO Corporation — includes two models, the S97 and S98, to meet the needs of growers seeking class seven and eight machines. Modifications to the feeder house, drive electronics and drive mechanics have been developed to help improve grain quality, reduce loss levels and reduce compaction. "Today’s growers must harvest more crop from more acres in an increasingly narrow harvest window which means they need a combine that can adapt to and perform in less than ideal harvest conditions," Gleaner product manager Shane Jardine says. "We’ve incorporated the latest technology, comfort features and even more engineering advancements to ensure our combines provide operators the ability to handle whatever harvest conditions they face during long days in the field." Gleaner’s Vision cab has many new features to enhance operator comfort and simplify control. The completely redesigned cab is 15 percent larger than previous models and has a larger instructor seat with a fold-down back that doubles as laptop computer storage and workspace. The cab features a 22 percent larger, deep-curved front windshield and 6 square meters of total glass area for an exceptional view of the cutter bar, header ends and harvested areas behind each side of the header. Sound-deadening material throughout the cab keeps operating environment as quiet as 75.5 decibels. AGCO says the completely redesigned control console is located to the right of the operator’s seat for increased operator comfort to reduce fatigue during operation. Buttons to adjust rotor speed, gear selection and bin extension operation are located on the right edge of the console. The new Tyton terminal has a colour touch-screen, so operators may monitor and control multiple combine functions with ease, the company says. The feeder house floor has been lowered and the feeder house runners and torque tube raised, creating clearance under the feed shaft. These changes reduce stress on the shaft, yet maintain good control of the crop mat in difficult feeding conditions. New electronics and redesigned hydraulic systems eliminate all cables and linkages for the hydrostatic propel system and a 13,743-litre bushel grain bin is standard. Gleaner S9 Series combines offer growers the choice of a factory-installed FieldStar Live mapping system integrated through the Tyton terminal. The system integrates data from yield and moisture sensors, global positioning and the Tyton terminal to provide live mapping.